Heraldry: Something I Just Have to Share! 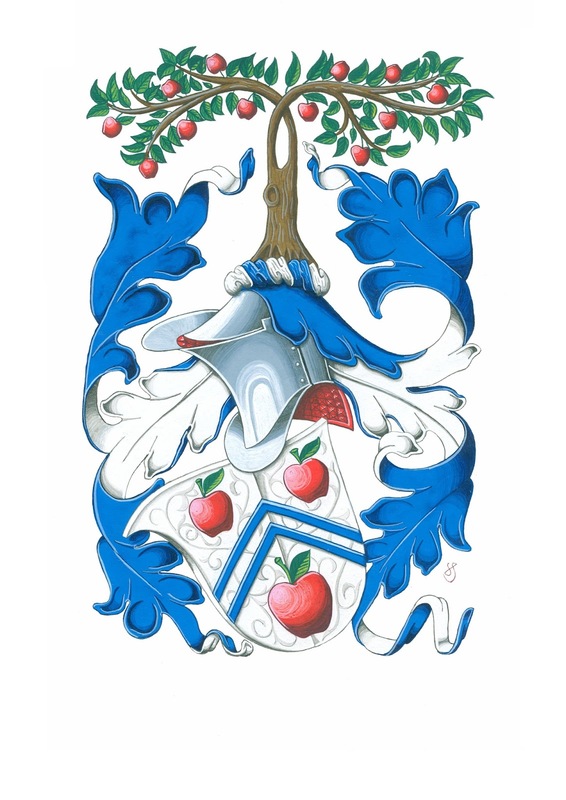 It's always fun to have an heraldic artist do a depiction of one's coat of arms. Plus, I always enjoy bragging on my friends. Our (and I have to say "our"; I'm pretty sure he likes Jo Ann a bit more than me. Not jealous, just a fact) friend Sunil Saigal, with whom we always enjoy getting together at the various International Congresses of Genealogical and Heraldic Sciences, is a very good heraldic artist, though his job doesn't always give him the time he'd like to devote to it, or any of his other hobbies for that matter. Still, among other things, for his own pleasure he keeps a liber amicorum, literally a "book of friends," in which he draws their coat of arms and has them sign that page. Then, as time allows and the inspiration strikes, he draws another copy of their arms for them. I was thrilled a couple of weeks ago (the same day we were leaving for several days to visit my mother in Las Vegas, as it happened), I received a large envelope from him with a copy of my arms inside. As I said, he's a very good heraldic artist. The weekend after we got back from visiting my mother, I went off to one of the hobby and craft stores and purchased a picture frame and some mat board of an appropriate color. (Yes, I have a mat cutter, and I'm not afraid to use it!) So now his wonderful illustration of my coat of arms is up on the wall in my home office, and looking quite nice there, too! (I may end up rearranging some of the heraldic items on the bookshelves below it for a better visual balance, but all in good time.) The following are not the best photographs, having been taken with my cell phone, but should give you a good idea of this new splash of heraldic color on my office wall.